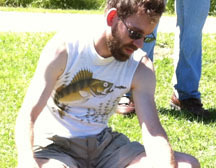 This week’s BEACON Researchers at Work blog post is by MSU faculty member Chris Waters. Tennyson’s famous phrase eloquently describes the adversarial nature (pun intended) that arises from Darwin’s concepts of natural selection and survival of the fittest. From a human perspective, these concepts are easy to understand. One only needs to attend my son’s little league games to see how competition is ingrained in humans. Competition for limited resources leads to genetic winners and losers. This idea permeates throughout the tree of life; indeed, visit the Lenski lab at Michigan State to see the ongoing results of a 25 year Escherichia coli “cage match”. But we all know that natural interactions are not always adversarial. Humans are also highly cooperative individuals, often helping one another at their own expense. Bees, wasps, and ants, live in highly cooperative communities in which individual members forgo their own reproduction for the net good of the group. 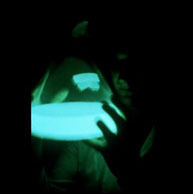 Bioluminescent Vibrio harveyi actively quorum sensing. It has become abundantly clear that even unicellular lifeforms participate in highly complex social interactions. The first appreciation for social interactions in bacteria came with the discovery of chemical communication in bioluminescent Vibrios. It was found that these ocean growing bacteria prematurely induced bioluminescence when exposed to cell-free supernatant harvested from a dense culture. It was subsequently determined that bacteria produce and secrete small chemical signals, termed autoinducers, to coordinate behaviors in response to cell density. We now appreciate that this process, known as quorum sensing, is widespread in bacteria and it is generally hypothesized that all bacteria engage in some form of chemical communication. Autoinducers, and their sensing apparatuses, come in many flavors, suggesting that this is a highly beneficial trait that has coevolved multiple times. Quorum sensing is often considered to be a mechanism for coordinating cooperative behavior in bacteria. While I think this aspect of quorum sensing is often overstated, it is quite true that many cooperative tasks are controlled by quorum sensing. For example, secreted “public goods” (i.e. shared benefits that all of the members of the community can utilize, not just the producers) are often clearly induced by quorum sensing. This cooperative situation leads to a strong selection for freeloading cheats which can gain the benefit of the public good without paying the production cost. Imagine five students working on a group project-at least one is typically a freeloader who gets the benefit of the grade without putting in the effort. This is an evolutionary smart strategy for the freeloading individual, but this strategy destabilizes cooperation within the group. Eric Bruger pondering the evolutionary underpinnings of quorum sensing in bacteria. Eric Bruger, a graduate student in my laboratory, is studying this fundamental social evolution question-the evolution of cooperation-in the bioluminescent bacterium Vibrio harveyi. Studying social evolution using bacteria has a multitude of benefits including fast generation times, huge population sizes, easily measurable phenotypes, exquisite control of the environment, and, perhaps most importantly, the ability to genetically manipulate the cooperative state of test subjects (the ethics of genetic manipulation are much less stringent with microbes!). Eric has found that quorum sensing in V. harveyi does indeed induce public good production, and he has identified environments where public good production is required for growth. When Eric genetically manipulated V. harveyi to unlink public good production from quorum sensing control, leading to constitutive public good secretion, he found that this mutant strain was rapidly invaded by cheating cells. This led to a population crash, typically referred to as a “tragedy of the commons”. However, having the public good linked to quorum sensing stabilized cooperation and the cheats could not invade. Thus, Eric experimentally demonstrated that the ability of cooperating cells to communicate stabilizes cooperation! Eric then extended these experiments to study the natural emergence of cheats following experimental evolution of V. harveyi for over 2,000 generations. He observed that quorum sensing control of cooperation delayed cheater invasion, but eventually cheaters did emerge. However, communication prevented cheaters from sweeping the population, leading to a complex mixture of cooperators and cheats that is reminiscent of V. harveyi strains observed in the natural world. 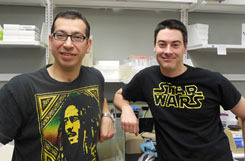 Will Soto and Chris Waters glean wisdom from all sources including Bob Marley and Star Wars to study quorum sensing. Public good production is but one of hundreds of traits regulated by quorum sensing in V. harveyi. How do the other regulated behaviors impact the stability of quorum sensing? Enter Dr. Will Soto, a BEACON funded postdoctoral fellow in my laboratory. Will is exploring the impact of quorum sensing on central metabolism in V. harveyi. Will examined the growth of three strains-the wild type strain with functional quorum sensing, a strain that cannot communicate, and the constitutive quorum sensing strain-in a hundred different laboratory growth media. He found dramatically different growth patterns of these strains, but, surprisingly, the wild type quorum sensing strain did as well or better than both quorum sensing mutants in virtually all environments examined! This result shows that communication in bacteria not only stabilizes cooperation, but it is also a mechanism to enhance colonization of many different ecological niches, suggesting that quorum sensing provides bacteria a large fitness benefit in the real world when faced with ever changing environments. Quorum sensing is but one of many social traits in bacteria. Most bacteria can also form multicellular communities encased in a protective matrix called biofilms. Some photosynthetic cyanobacteria actually grow as multicellular filaments and exhibit striking differentiation and division of labor. Yet others, like Myxococcus, undergo complex cooperative development and form multicellular fruiting bodies upon starvation. All of these systems are excellent unicellular models to test concepts of social evolution. Clearly, cooperation is not limited to us multicellular organisms; unicellular organisms have a robust social life. It is important therefore to consider not just nature’s “tooth and claw” but perhaps also “Nature gentle with helping hand”. To learn more about research in the Waters lab follow us on twitter (@WatersLabMSU) or visit our website: https://www.msu.edu/~watersc3/.